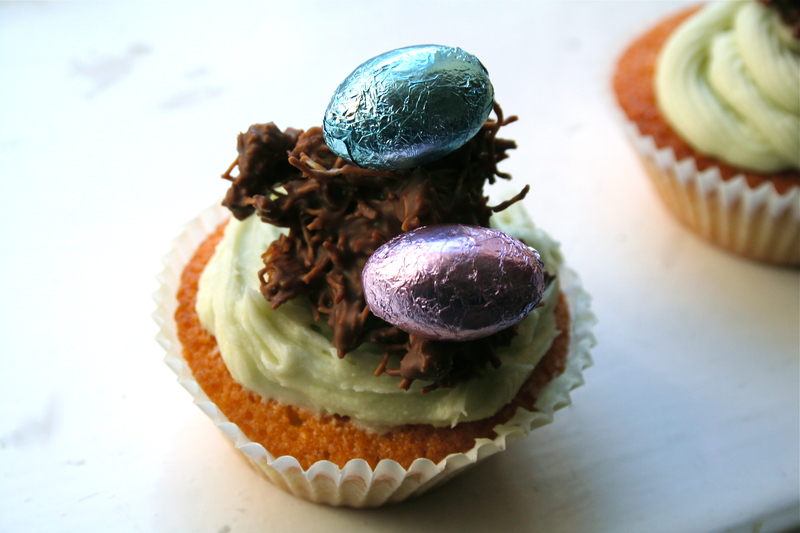 As it’s Easter, I thought it was the perfect excuse to bake some cupcakes – who doesn’t love cake? – and share the tutorial with you! These are easy to make, taste really yummy, and look rather pretty, if I do say so myself. They’d be a great treat to whip up on tomorrow’s bank holiday, especially if you have friends or family over. 1. Measure out all your ingredients and line your baking tray with cupcake cases. I find a good way to help the cupcakes stay a more uniform shape during baking is to use two or three cases per cake. 2. Soften your butter slightly (if you use the microwave make sure you keep your eye on it, as the difference between soft butter and a slushy mess is a matter of seconds!) Mix together the butter and sugar in your mixing bowl. It’s important to keep mixing until they are light, and fluffy! 3. Add a teaspoon of vanilla essence and mix in. 4. Add one egg to the mixture and half of your flour. Mix well. Then add the other egg and the rest of the flour. 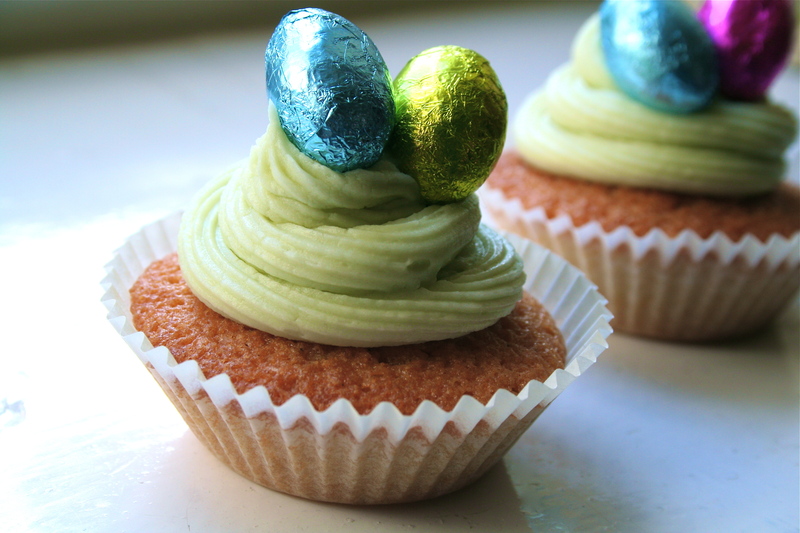 Once the mixture is thoroughly mixed and smooth, add the cinnamon to give your cakes that extra hint of Easter! How much you add depends on how strongly flavoured you want your cakes to be – I added around a teaspoon. 5. Using a teaspoon, transfer your mixture into the awaiting cupcake cases and bake in the (pre-heated to 190/gas mark 5) oven for 20 minutes, or until the cupcakes have risen and are lightly golden. A good way to tell if they are cooked properly is to gently touch the top of the cake and see if it bounces back into position! 6. Whilst your cakes are cooling on a wire rack, melt your block of cooking chocolate until it is smooth and runny. I used the microwave, on a medium setting, for one minute, then took the chocolate out to stir, and repeated until it was done. Crumble in your shredded wheat and mix with the melted chocolate. Using a teaspoon, spoon blobs of the mixture onto a plate, and put in the fridge to cool. These will be your nests! 8. Add a teaspoon of vanilla essence, and another of green food colouring to the icing and mix once more. 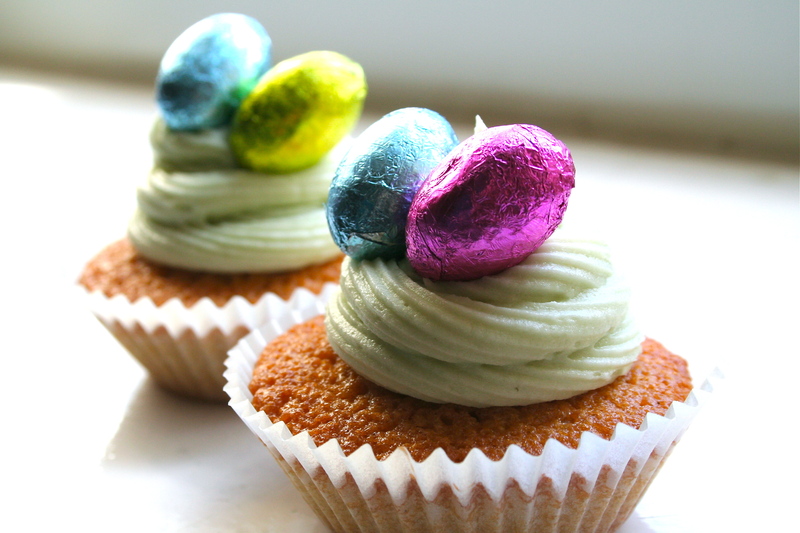 This will give your icing a great flavour and a nice, bright, colour! 9. When it comes to icing your cakes you can either use a piping bag (which I did for mine), or simply use the back of a spoon or a spatula. You can see both effects in the photo and, in my opinion, both look rather lovely! 10. Take your plate of chocolate nests from the fridge and use a knife to gently prise them from the plate. Place one on each cake. 11. 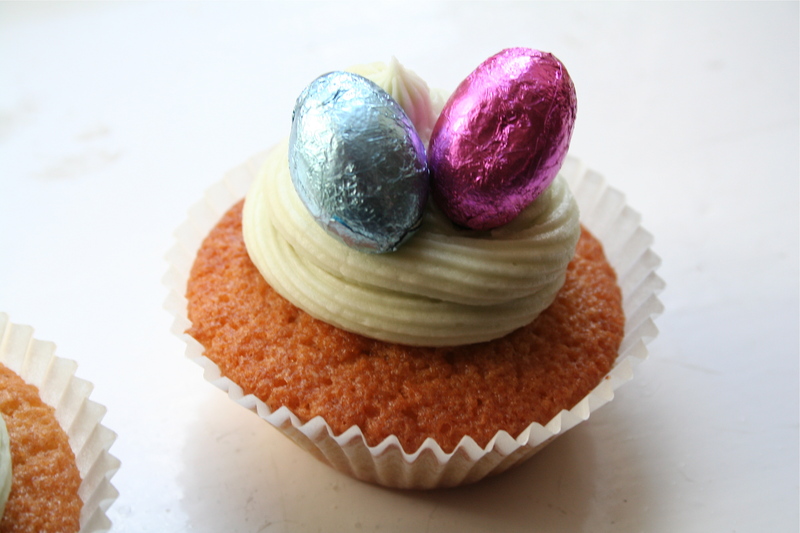 Add your mini chocolate eggs, and there we have it, a gorgeous Easter cupcake! 12. If you wish to make the process a little easier and quicker, you can skip the chocolate nest part and add your eggs directly to the icing. It still looks fab, and saves a bit of time! 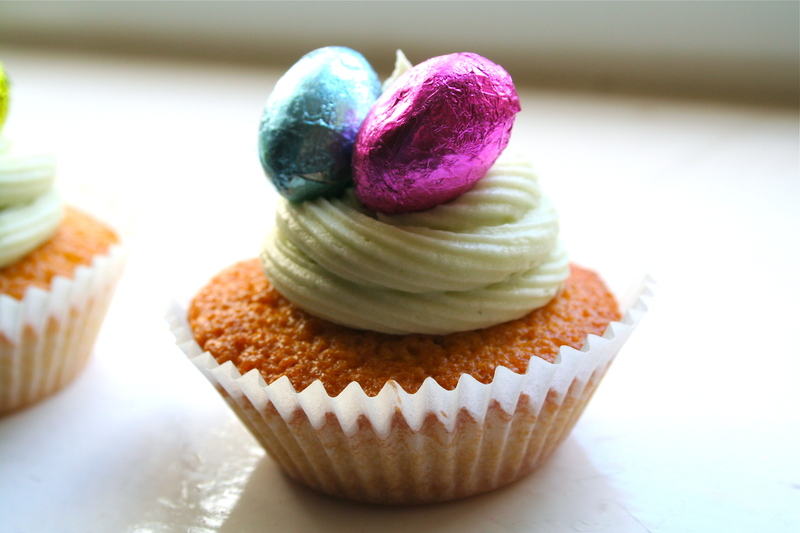 The cinnamon and vanilla work fabulously with the chocolate, and it’s a perfect taste combo for Easter! I hope you enjoyed me coming over all Nigella, and are having lovely Easter weekends! Head over to Handmade Monday for more Easter, craft, blogs to read! ← A Sneak Preview Of A Very Exciting New Range! Anything that includes chocolate and/or cinnamon gets the thumbs up from me, great photo’s too. They look so yummy! Thanks for the recipe, love the idea of using shredded wheat! Those are adorable cupcakes! What a creative way to decorate them. Makes me hungry! Thank you for sharing this great idea. Loving the idea of adding chocolate nests to cup cakes. A really:) nice extra texture. Hope you had a great day. They look delicious, and your photos are worthy of a cookery book! Yummy yummy! I might have a go at making these later this week! I love the way you have taken your photos for the tutorial, I will make a mental note for how to present each stage for future reference. The cinnamon sounds a lovely touch for that extra taste. Lovely. They look lovely and I best that taste scrummy. Many thanks for sharing the recipe. Hope you have a good week.